This presentation will be held at the Easttown Library & Information Center in Berwyn, PA on Sunday 28 April 2019, starting at 2 pm. Clarissa will explore the role that mildly-alcoholic brewed beverages played in everyday Colonial life, and may even bring a sample of her persimmon-based receipe. Small beer is a lager or ale that contains a lower amount of alcohol by volume than other beers, typically in the range of 0.5% to 2.8%. Small beer was usually seen as socially acceptable because its low alcohol content allowed people to drink several glasses without becoming intoxicated. Sometimes unfiltered and porridge-like — perhaps even containing small bits of suspended wheat or bread — it was a favored drink in colonial North America, and was often produced in households for consumption by children and servants. 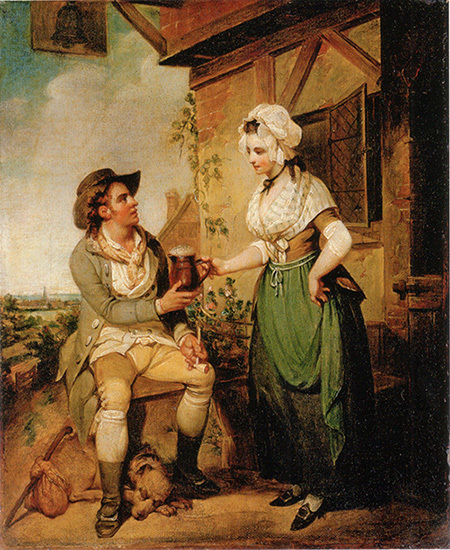 Small beer was also drunk for its nutritional content, and it was common for workers who engaged in heavy physical labor to drink more than five quarts of small beer during a workday to quench their thirst. Another factor to consider was that unprocessed drinking water had the potential to cause illness because of possible, but as yet unknown, bacterial contamination. Practical experience showed that fermented beverages were less likely to produce such illness. — adapted from the Wikipedia entry for "Small beer"
Clarissa Dillon grew up in Chicago. She taught there and when she moved to Pennsylvania she taught in Radnor for 24 years. She has her doctorate in History from Bryn Mawr College and has been active in "living history" since 1973. Although much of her work involves using her research to produce foods, domestic medicines, and other products of 18th-century women's work, she enjoys the occasional "traditional" project.